This was my 3rd year at this show and it was absolutely disappointing compared to the previous year. Vendors were placed in their own room along with several panels throughout the day. We arrived before staff was there to check us in. Attendance was way down from the previous year as were sales. The show is super inexpensive, but attendance left me feeling that it wasn't even good enough to call good for networking/advertising. 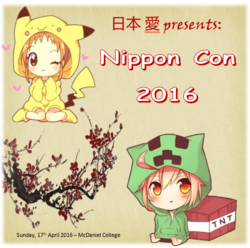 This is a small college convention put on every year at McDaniel College by their anime club. Attendance is a few hundred, and the table cost was only $10 this year. This makes it an ideal con for new artists, allowing you to work out all the kinks while not putting much money out. This is not a con for huge profits, so if you have other shows the same weekend, it's not one to prioritize, but I really can't overstate its value as a starter con.